It’s an uncomfortable and sad movie about uncomfortable and sad people. The most stable character is the one who gets killed. 😦 Parallels between du Pont and Mark Schultz and how they are so not at ease in their own skins. 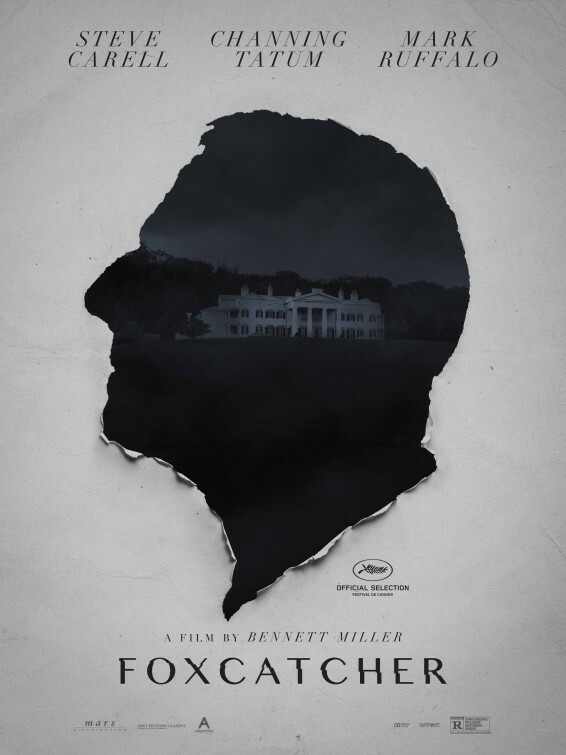 I didn’t love the whole movie, but is a great portrait of how we allow the rich to be crazy because they’re rich. Then again, du Pont did go to jail . . . Ending with Schultz in that horrible ultimate fighting ring, is good. Tatum and Ruffalo are so much better in this film than mannered Carell, who acts with his nose. We need less of him and more of Ruffalo. Then . . . Channing Tatum, the hermetically sealed man, wrestling with dummy, as Mark Schultz. At school, “I wanna talk about America, and why I wrestle.” Mark Schultz moves like an ape (which John du Pont actually calls him) who hasn’t learned to walk properly. He has permanent scowl on face. He walks like a cowboy. His lower jaw juts out like a bulldog (as opposed to fox hounds): a prognathic jaw. Are there any prosthetics involved, or is Tatum doing that, himself? Tragedy of inarticulate brute. Film starts in 1987 and appears to end in 1988, though Dave Schultz was killed in 1996. Mark Ruffalo as Dave Schultz – stretching and “play” fighting with his brother. A wordless brother battle. Mark touching face while looking in mirror, then hitting himself. Steve Carell’s prosthetic nose looks real, but after a while I began to feel as if he was acting with it. He plays du Pont with autistic speech pattern. There are long pauses in the film, and not always for reasons that feel organic to the story. Heads and tails of shots not always left on for right reasons (as in Tatum’s first entrance into Carell’s bathroom). Du Pont is an ornithologist – keeps stuffed birds around, and probably thinks of Mark Schultz as just such a bird. Taxidermy. Du Pont firing gun in wrestling room. He does cocaine in helicopter with Mark – makes him do some. Schultz then loses his way for a while, until Dave shows up to sort things out. Mother like Psycho or Manchurian Candidate.